All Your Web Site, Social Media, and SEO Needs - With One Monthly Subscription! Get your group practice on the Web, on Social Media, on Video, and on top of the search rankings - with the VertexMD Web Marketing package. Now your group practice can have the Web site you've always wanted. A professionally designed and developed Web site. A site that you and your staff can edit, update, and manage - quickly and easily, using online tools. Promote your Web site on your own branded Facebook, Twitter, LinkedIn, and Google+ pages. Get your own Youtube channel, complete with up to 6 videos promoting your practice and services. VertexMD is a simple, hassle-free way to make sure your Web site and social media accounts are fresh and up to date. 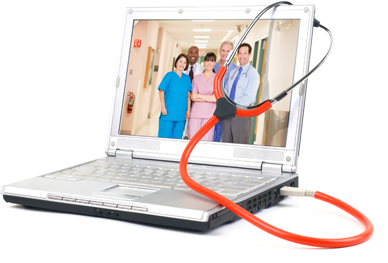 Make sure your practice group is taking advantage of all the latest technologies the Web has to offer. Our continuous social media updates and SEO monitoring will ensure that prospective patients are always aware of your practice and can find you immediately when searching on Google and Bing! All our physician Web sites are built according to responsive design principles, which means they will automatically adapt to whatever device you're viewing them on - your PC, your laptop, your iPad or Android tablet, your smartphone. And with our content management system, Site Press®, you can take control of managing and editing your own site, saving you time and expensive maintenance fees. What are you waiting for? Click here to sign up for a free consultation with one of our trained specialists or call toll-free now - 877-610-0049. Let us show you how easy and inexpensive having a great presence on the Web can be! Customer may cancel subscription at any time after the first six (6) months of service. A minimum of six (6) months is required for all subscriptions.